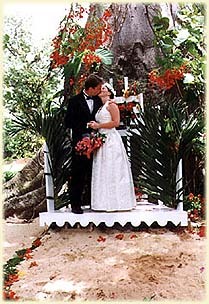 The property is ideal for small weddings. Perhaps the most picturesque spot for the ceremony itself is on the smaller of the two beaches at the foot of a giant cotton tree. A wooden altar decorated with palm fronds and Bougainvillea adds to the natural charm of the spot. 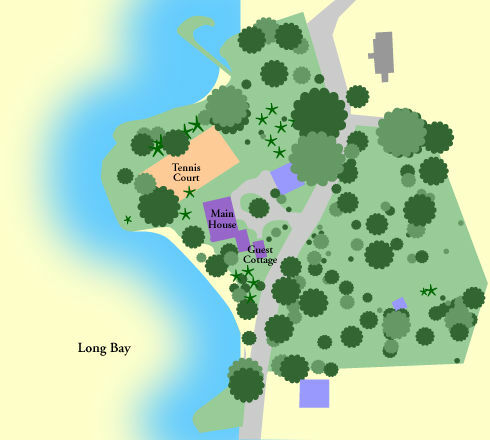 Guests can assemble on the beach and a long, natural aisle runs along side the windbreak of the tennis court from the house. The ceremony can be conducted by a Justice of the Peace or a protestant minister. Catholic weddings need to be performed in the local church. Here the Reverend Winston Barrett is bestowing his blessing on the happy couple. The food can be presented either buffet style for groups larger than fifteen or family style for groups less than fifteen. 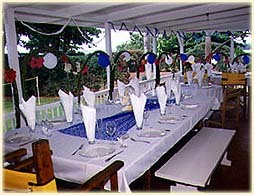 The buffet costs $50.00 per person and the family style meals cost $20.00. Beverages are excluded from the price and the selection of the type and the amount is made by the guests prior to the reception. These can be purchased and delivered prior to the reception and payment will be due on receipt. A 120 gallon ice chest with ice will be provided for cooling the beer, wine and soda. A bar tender can be hired for mixed drinks. The wedding cake is also not included and can be ordered specially for the occasion. The price will depend on size. The price range is $80.00 - $100.00 for a simple, but elegant cake. The staff is prepared to serve groups up to 28. At this point, there are tables enough to seat 28 on the veranda. Larger groups can be served, but adequate advance preparation will be required regarding the purchase of additional tables, tableware and linens. The decorating scheme and table setting style are left to the planner for each wedding party. Below left reflects a formal style with a particular color scheme as a theme. Below right is a more casual approach; this party didn't even want a white table cloth on the serving tables even though we offered them! Wedding bouquets and boutonniere can be purchased. Added floral displays can also be obtained at an extra cost. Music can be played on the house stereo system but live bands can be hired to play pop, reggae, soca or calypso. However, with the abundance of flowers and brightly colored leaves on the property, floral arrangements can be provided at no extra cost. intimate ceremony to more elaborate events for larger groups.